Schoolash - School is one of the formal educational institutions that serve to enhance the knowledge and abilities of children, school is where we get a variety of science in preparation to survive in the future. Pemahan and the introduction of the environment can be obtained menditail children through education in schools. Develop and promote green school program. Reduce or conserve lamp cooling classrooms, water and other energy consumption. Build waste disposal mechanisms in place to learn. Providing bins based on the type of waste. conditioning the extra curricular activities based environments, such as green groups, nature lovers and the like. 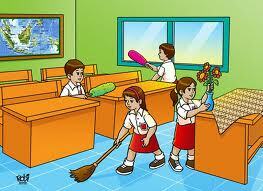 Implement the rules of cleanliness and preservation of the environment in which to learn. Develop a love and concern for the environment in which students learn through a variety of grasping environmental care, such as hygiene competition between classes, writing, drawing, or a variety of other creativity that are environmentally friendly. Conduct oversight and enforcement of discipline. Overall, the cleanliness and beauty of the place learning is a shared responsibility of every citizen a place to learn. In addition to teachers and students, the maintenance and the embodiment of a clean environment in which to learn healthy and beautiful can not be separated from the role of parents, private, non-governmental organizations or government. Such conditions will give birth to a smart student, grade, environmentally friendly and able to implement an attitude of love and caring learning environment in their neighborhood or community. 0 Response to "How to Maintain Healthy School Environment"